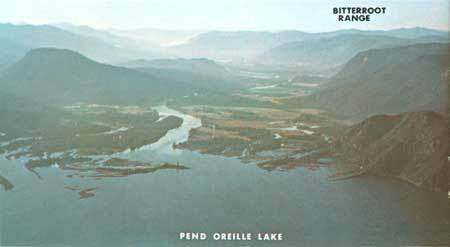 As the Purcell lobe moved southward within the Purcell Trench, glacial ice plugged the Clark Fork Valley like a giant cork, with the 2,000-foot cliff at the extreme northern end of the Bitterroot Range serving as a buttress. The ice dammed the Clark Fork River near the point where it empties into Pend Oreille Lake. Fig. 11.Cliff buttress at northern end of Bitterroot Range and mouth of Clark Fork River. The water that was impounded behind the dam filled the tributary valleys for many miles to the east. At its highest level Glacial Lake Missoula covered an area of about 3,000 square miles and contained an estimated 500 cubic miles of waterhalf the volume of present day Lake Michigan. Its surface stood at 4,150 feet above sea level, giving the lake a depth of nearly 2,000 feet at the ice dam (more than twice the depth of Lake Superior). Traces of ancient shore lines in western Montana indicate that the lake was about 950 feet deep at present-day Missoula, 260 feet deep at Darby, and more than 1,100 feet deep at the south end of Flathead Lake. The glacial lake's eastern shore was some place east of Drummond. The Drummond area itself was beneath nearly 200 feet of water. 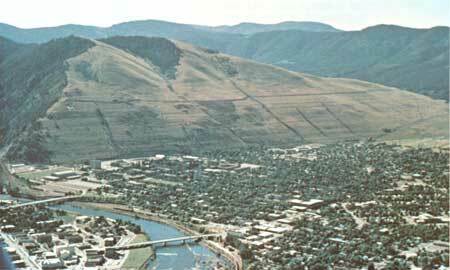 The shorelines of Glacial Lake Missoula are still visible in several places and are especially well shown at Missoula. The wave-cut shorelines are faint and delicate, suggesting that no one stand of the lake was of long duration. The close spacing of the shorelines may indicate successive water levels as the lake gradually filled. Fig. 12.Wave-cut shorelines of glacial Lake Missoula on Sentinel Mountain, Missoula, Montana. The lake once had a depth of 950 feet where the University of Montana stadium now stands. While ice plugged the mouth of the Clark Fork River at the Idaho-Montana border, other glaciers contributed meltwater to the growing lake. A large lobe of ice from Canada reached the south end of present-day Flathead Lake, and at this point its rate of melting was greater than its rate of advance. Its terminus became part of the north shore of Glacial Lake Missoula, and its meltwater poured in the lake. Alpine glaciers in the Bitterroot Range added their meltwater, and summer rains and snowmelt also helped to raise the level of the lake. Eventually, the lake level reached the lip of the ice dam and began to overflow. One can only guess at the details from this point until the dam was breached completely, but some aspects of the event can be surmised. The overflowing stream must have cut deeply into the ice. As the outlet was quickly lowered, the water roared through the breach, probably widening the channel very rapidly by undercutting the sides until the dam collapsed. No doubt huge icebergs were ferried away by the stream. Within a very short timeperhaps no more than a day or twothe ice dam was destroyed and the contents of the lake were released.